Sorry, this video is available ONLY IN RUSSIAN !!! This complete step-by-step course consists of 9 detailed lessons, around 4 hours of video. To make the work comfortable, each video lesson includes a separate stage of the process of creating the toy. The master course is shot from close distance and features detailed comments on the process. You will feel like you are working alongside with me, as you would do on a live session. And of course you will be able to pause and come back to the point that was unclear, or contact me directly with your questions. This master course has been designed for beginners in the first place, but I think that it could be useful also for the more experienced handcrafters. 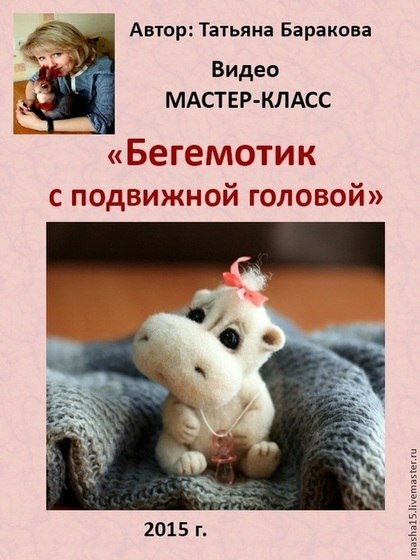 I hope that the basic knowledge that you will get in this course will enable you to create a toy of any animal you wish. After making the payment you will get the download link. You will also get admitted to a closed Vkontakte group, where you can always ask me all the questions that arise during work, as well as to show others your new-born babies). I will send you a personal message with the instructions on how to watch the video course. As a GIFT, in addition to the course I will send you a PDF-book “4 Ways to Attach the Whiskers”.